Also with children this young, I try to keep the parents participating. So I mix in elements that keep the parents' interest. A guitar playing style that packs variety and references rock and pop styles helps with this. 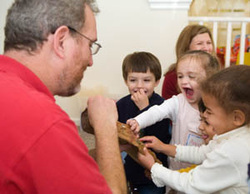 Very young children definitely appreciate humor, so a facile understanding of toddler humor is helpful for integration with puppets and magic props. At the outset, it's necessary to gain their interest and trust, and subtly train them to follow my lead. Then the interactive show must continue forward with momentum and fresh tactile and visual experiences. Children this age are attracted to driving beats. The arc of the show is also important. After gaining their trust, I like to get them on their feet, dancing, jumping, marching, etc. But eventually the excitement must be wound down, and the children must be grounded again, so the momentum can begin to build anew. Most people don't realize that there's a lot to it, especially with children younger than three. Once they're three and older, one can appeal to them with linear story lines, much more sophisticated role-playing and the like. The younger children understand a language that might be called "energetic." They are "here now" and the performer must have the presence to be "here now" with them. A birthday party performance, in my experience, is actually the most challenging show to do, more so than a school or library show. The kids know that they don't have to behave. They are not in a place that has already established a certain decorum or pattern of behavior. And the atmosphere often isn't ideal for a show. Adults may be talking. There can be all sorts of distractions. The performer has to be really skillful to grab the children's interest and keep it. Having done about a thousand birthday shows in every conceivable environment, from massive toy-littered basements to cramped living rooms to noisy restaurants, I find a way to make each party fun and memorable. How? A vast repertoire, experience of what works and what doesn't in all sorts of situations, and a natural sense and love for this work.